Joseph Raffael journal entries to appear in forthcoming Nancy Hoffman Gallery catalogue. In those beginning years, speaking little if at all, wide-eyed and open-hearted, I began experiencing Life's mysteries, documenting the powerful silence within, while each day, drawing and coloring. Inner experiences enriching the inner self who would be doing my paintings' navigation for me years later. As a child I was alone drawing. To this day, I continue to pass my days alone—painting. In his book The Soul's Code, James Hillman discusses how the acorn already has the oak tree encompassed in it. I sensed in the seeds of my youth how important “place” would be in my own life. I appreciated my father's and maternal grandfather's symbolic input as a traveler’s in search of the realization of the self. They had left Sicily to go to Sydney, Australia, and then turned westward to go to New York. 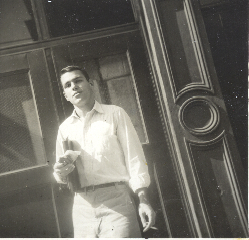 My mother's father left Switzerland for New York. They planted in me the notion that one must make a long, courageous journey to arrive at one's fulfillment. I was born in Brooklyn, lived in Manhattan, then lived in Marin County, California, before I finally moved to a foreign country—France. Moving across the sea to find “a new life” played a very important, even crucial, part in my life. My father, and his father gave me that gift, as did my mother's father. Actually, it was a treasure, offering me a certain courage to enter new unknown territories. It may sound odd, but I feel this way each time I begin a new painting. Each time I'm confronted by the new white space of a painting, I feel like an immigrant, a foreigner entering an unknown country where new life is possible. At Yale I also discovered Botticelli's drawings for Dante. 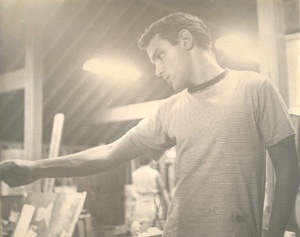 As I consider how childhood affects the artist, I realize that, in fact, it was after my mother's death, 3 Nov 47, when I was a freshman in high school, that I entered into a kind of deep seclusion and interiority, and began consciously making, for the first time, “paintings” as such. The first painting was one I did in that month of November, a few weeks after my mother's passing. It was a gouache of an autumn forest. I recall I did it on a Friday evening in my room, which earlier had been the room in which my mother died. So a kind of ritual took place, a ceremony of sorts, during that grief period in which I became sure that I was to live my life as an artist. In the same period more or less, while I as a young-beginning-artist on my own in NY, I saw Sean O'Casey's autobiographical play I Knock at the Door and Pictures in the Doorway. The Playbill said he lived in Torquay, England. I learned then to always answer those who write to me whom I don't know. At sixteen it was Tchaikovsky's 6th later to be replaced by Prokofiev's 5th, when I was 17. Listening to those records borrowed from the Bklyn Public Library, Grand Army Plaza Branch, listening to them on rainy, wind-blowing-trees days, their branches’ shadows choreographing on my bedroom’s walls. I'm having such a fine time ptg this new ptg (Inauguration). I've been saying I want the ptg to pt itself. It knows so much more than me. Et voilà, it is and it does. You know how snow falls? It's like that. As life is happening it might seem to be by chance, but in retrospect it’s clear it’s all had its purpose. For example--three “school” events which altered my life forever. Tears have come four times for me in looking at paintings in a museum setting. Each time I was surprised.The first time in Florence standing in front of Giotto's Crucifixion. Then, later in London seeing a Piero della Francesca Nativity. My mother was a farmer's daughter from the tip of Long Island. As a family, we lived in Brooklyn. It was WW II and we had a victory garden and flowers in the backyard. The garden meant something very deep to my mother. I helped her with it. More than anything else my own experience of the plant nature realm was influenced and inspired by my mother & that garden amidst its plants and the cherry tree. I, now 6 decades later, paint cherry tree blossoms from Lannis and my garden here in France. The Brooklyn garden is where I first witnessed the patterns of seasons, the dormant times, the flourishing times. I think nature's alchemy really affected me from those beginning garden times. Alchemy and magic in the sense of the wonder of watching buds come out of the earth. They weren't there yesterday, but here they are today. Seeing blossoms come alive is the same as watching a painting come forth out of the white space of a page or a canvas. The garden is another example of how one begins with nothing but seeds and the brown colored space of the earth, from which, little by little, the garden emerges. Also another gift my parents gave me were our summers on Long Island Sound in Peconic, N.Y. The house a stone's throw away from the beach, where I could at an early age watch all by myself the water and the sky's reflections on the water's surface. My water paintings grew out of those soul-strengthening moments. Also the skies and water at Peconic Bay where my mother, sisters and I would go and watch the sunsets over the Bay. We would just sit on the beach around a fire or in the car at the beach front at twilight watching the darkening sky change from its pink, magentas and oranges to its final indigo. I think of that windshield as though it were a picture frame. We were, in fact, looking at nature's moving pictures, or of a painting's subject slowly, slowly moving. Then, later in the dark, around the beach fire, we would watch the stars appearing one by one. The sky and water were our works of art, the setting, our museum. Along that water's edge I would muse about the water, dreaming upon its surface. 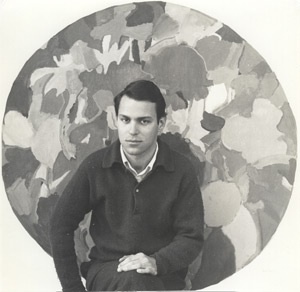 I was traveling with my friend Peter Hujar, at that time a young unknown photographer. We traveled to London and began visiting the museums of London, Amsterdam & Paris. At all those museums I had purchased postcards of paintings of bouquets of flowers. I must have collected at least 60 or so. Then, finding a small house on a hillside over looking the Arno River with Florence’s Duomo Cathedral visible from the studio’s window, we began doing our art. The house had a garden. Peter planted zinnias. Later, I painted them in an abstracted manner in large oils, and also made a handmade book with calligraphy of Ernst Juenger's “On The Marble Cliffs.” It was illustrated by watercolors inspired by these zinnias. The first means beautiful glance. The second means to see beautifully or to see beauty. I think I'm right about the definitions. They're more or less correct. Someone, at some point along the way, wrote, "Raffael's ptgs are for those who are not afraid of beauty." There, at 3 via Bellosguardo, the beautiful cupola of the Duomo Cathedral could be seen from my studio window. That studio, a small room I ptd in was like a monk's cell. In other words, It's all been on purpose. Nothing gone to waste, no matter what it was or what it felt like. Now, 5 decades later, I am living and working in a small house overlooking the Mediterranean, and for the past year or so I've been painting mostly bouquets, flowers collected from Lannis’s and my garden here in Antibes. I feel that too. Their incandescence is reassuring. Their inevitability, surprising. Everything I've been saying these past yrs about letting the invisible become visible and getting out of the way to let the ptg pt itself. It's been happening over and over. On its own. I'm just a witness to it. Anniversary of my Mother's death 3 Nov '47. Since back from the desert, I've begun a new ptg as of yest., the 1st Biography ptg. In it appears the studio wall which is nearest the Sea, and a 1/2 each of the large arching glass doors on either side of the wall. All of this had been on the studio wall, and I decided to paint it, one day in September, and to call it "Biography". In it various aspects of my life appear in the form of photos, repros of ptgs, collages, and a litho done more than twenty years ago (which recently I added watercolor to, and w-c'd its white border). There are also a couple reproductions including a V.Gogh collage I made yrs ago, plus V.Gogh's "le pere Tanguy" ptg, etc. All the images represent different aspects of my life. 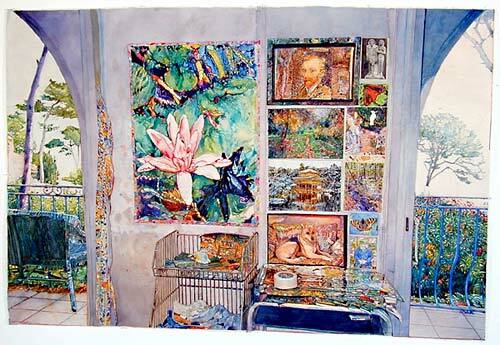 A glimpse into the artist's studio where the Art is conceived, born and nurtured. I'm so appreciating this life as an artist I've been given . In a way, this ptg will be another homage to that. A morning working on our dog "Beauty"-in-the-wood-photograph as the sound track to Aldomovar's film "Talk to Her" continuously plays on. I've played it all the time since our return. Its haunting quality keeps me in mystery realms. Also not listening to any news, purposely. Finished "Beauty". Also the 1st butterfly. Also V.Gogh's "le pere Tanguy" . Under these images I've begun the large glossy shiny photos which lay on the table. I'm enjoying how the above reflects on the below. It's like reflections on water. Lynne Z came this early evening to explore book project. This ptg is a 'whole' image and, at the same time, also made up of clusters of individual images. In this way, it relates to my early 1960's white ground paintings and the 'whole image' paintings which followed them. Finding it not easy or flowing to work on ptg. The Golden Kyoto Palace and Brugh's Treescape--T hey're both so complex. I believe, due to talking so much the last two days for the book project, my mind is a bit askew . Just not used to it There's not been the mental space necessary to organize these visual complexities. Perhaps the solution is to do bigger blockier-shaped images during this time of verbalizing and introspection, and then do the detailed stuff later. Began the Angels and Aposh collage. Is it a Van Eyck? This turns out to be very demanding also. I sat quietly and that did still the mind, helping me get centered. Need to get deeply into the ptg, and also be available for Lynne's limited time here. Got quite a bit done. It's sweet and innocent. These two angels with our cockatoo, Aposh. All these parts coming together, adding up to a whole. Today in a tired state, I saw clearly once again, how important for me to maintain the necessary energy to do these ptgs I want and need to paint. The angels and Aposh section is well along, and this afternoon I continue with them and also begin another image. But for now, a petite sieste. Needing to slow down today and take one step at a time. This AM I walked the dogs in the nearby wood, prepared clean water for today's w-c'ing, and then chose the next image to work on. I decided to do the Kyoto Temple upside down. Less daunting. Seeing its pictorial qualities in a fresh original way, I won't get hung up on its almost impossible architectonic elements. It worked. Made progress with the Kyoto Palace. It's slow with tiny details, and it is working. Thus far with the ptg, I've been solely concentrating on the appendages to the wall. However, at a certain moment today, I found myself seeing in actuality the wall plus the windows and the scene outside. In other words,the bigger picture. I had lost sight of the forest for the trees. So, I was able to see the whole image that the ptg will be. Much flowing forth. Needing to center and to contain. The imagery in the ptg doesn't simplify matters. Brugh's forest scene in this smaller format is an even crazier mass of complex contradictions than the photo is in its original size. Same thing for the Kyoto Palace. Also Beauty in the wood. Yikes! It's hard and unsettling. All this combined with our three way conversations being taped each meal time...I'm a wreck. However, trusting it all. Friday, I'll be back in studio in full swing. Lynn's Final day here. It's been a rich time. Much has already occurred on many levels. Alchemy. This past night---much heavy, pounding, solid, penetrating rain. Last evening, I had the very strong sense that the recent trip to Paris and the 30 films, plus the Desert Experience with all its mysteries and inductions have had their most profound effect not yet revealing their deepest nature. This morning, at last spoke and taped with Lynne a conversation specifically about the painting. It felt very good . Began reading Savage Beauty, biography of Edan St Vincent Millay, which Lynne left for us. Last night a dream about an artist wanting to make and direct a film and wanting me to star in it. The good news is that I was able to paint well on Brugh's forest scene. Been ptg the V.Gogh self-portrait collage which I've been wanting to paint for atleast 10-15 yrs. It touches and amazes me how this man's depiction of himself in certain of his self-portraits has so fascinated me. I've ptd him atleast 4 times, and also done collages with him in them. Now this collage, I made in California, on Tamarack, all that time ago which has traveled with me from studio to studio, is finally becoming a ptg. What would a biography of mine be without Van Gogh in it? A fine day of ptg. Working on the V.Gogh collage, and also the Egyptian Couple sculpture. The sculpture's being ptd in a kind of greenish, not quite sepia, more of a neutral tint/pale rose coloration. So, the day's been good, and I finally feel here and home at last! A clear, beautifully crisp, getting colder day. All's well here. At last, I'm fully 'back'. So much good energy today. It feels mighty. Working now on the Beauty-in-the-wood tableau. Basically, it's the final one. What remains afterwards is the litho "Pink Lily with Dragonfly" of 20 plus yrs ago. It's on the left side of the wall. That'll be interesting to paint a ptg of a ptg, which, as it turns out is already an interpretation of a ptg. After that it'll be the rattan bench which'll be a good wk's work. First, I must redraw its structure. And do it well. After that the cobalt blue balustrade. Thank God, we ptd it blue and not green. This way it'll be so striking in the ptg with the green foliage all around it. After that the pines and the sky. Today, a major one for us. Lannis doing a healing this afternoon, and I have major roads to travel in the ptg and alot to do in the studio. These days are so strong, so powerful. I have almost too much energy. Everything seems on fast forward. I want to and need to get in 'sync' with my ptg, with our life. There seems to be so much going on. I'll pull a Tarot card. I pulled "Wheel of Fortune". So, I need to stay objective, be flexible, and be open to the energy, no matter what it may look like. A night full of dreaming. Awoke just a bit ago, a little before 7. These dark-end-of-autumn mornings, the birds outside (and inside), their stirrings and their 1st sounds beginning later and later. The dogs too wake less early. There's so much to do today and everyday. I want to get the correspondance done now, so that I can get an early start with the ptg. Yest. got a good start on the blue railings. Looks like a few more wks yet for completion of ptg. Finished right side of balcony--the balustrade, the leaves with the red shapes amongst them, and then in a few moments some light washes for the tiles. Quite miraculous, all of it.... The vertical balustrade, the horizontal floor bringing my eye inside through the glass doors, then up and seeing the images on the wall. Very much enjoying the E. St V. Millay biography. Next, plan to read Dylan Thomas' and then TSEliot's. This is biography time. Who would have thought, who could have guessed it was coming? I've been avoiding these bks for yrs even with Lannis having bought them for me to read. Now, at last, I am ready to face the Poet's Life as well as the Poet's Death. One of these titles will turn out to be my Winter Solstice reading material. It's becoming clearer and clearer to me that this is a time of Summing Up. At 5:45PM I asked Georges to come in and help me with the rather tricky business of me focusing the slide projector so that I could begin redrawing the very complex rattan chair on the left side of "Biography". He checked the projection for me while I fiddled with the focusing. It went quickly. Tmrw AM I'll start the left half of the ptg. It will have its challenges: the rattan bench for starters and then the litho of "Pink Lily with Dragon Fly". Now to bed to continue rdg of E.St.V Millay's. It's getting more and more difficult for me, the reading of it, as she descends further and further into her hell. A friend, yesterday in the studio, without knowing the title of the ptg in progress said, toute de suite, "That's your life." The yr almost done, and in three wks The Winter Solstice....The Days Will Become Longer. I capitalize the words. It's like title-ing the event. It's like that for me, now. Everything becoming more meaningful and distinct. This time is passing so quickly. Feeling it particularly today. Working on the litho image is so much fun---ptg from a ptg which itself was after a ptg. It's actually even 4th generation. I could go on forever with this process. 5PM: Today, a pale panic of "Not enough time left". The ptg of the litho is inspiring. So painterly. It amazes me how much has been accomplished on the ptg in two days, and how much has happened also in our daily life here at Site Charmant. Mentally a-clutter and fatigued. Can't see forest for the trees. Now to bed to read a simple story, and then to sleep. happens it all flows more fluidly Therefore it's taking longer to understand the nature of each and what makes it tick. Continually start and go, start and go. Majorly important day in terms of realizations. Got clear about lots of things related to my art, and other aspects of our life which accompany it. Now, after a day off yesterday, I'm so excited about the six days ahead of ptg, ptg, ptg. Working on ptg. Needing to make some deep progress. It's taking longer than I thought. As I mentioned above, each section is a new ptg. Knowing that I must spend more time with the ptg. Six hrs a day is not enough. Must do more. An intense time. December always is. Particularly as Solstice approaches. The days become shorter and shorter. An anxiousness fills me. It's clear that I need to get into deeper concentration in the ptg. I've let myself be drawn too much into the peripheral aspects of the art. The ptg is the most crucial. Pearl Harbor 61 yrs ago. Hard to believe! My, how life has sped by. It feels like it's been 7 or 8 months not 70 yrs. Excellent energy today after yest's intensity and demands. The ptg's going very well. It's definitely a 'let-go' time. Letting go of any sense that it is me who is in 'control'. I'm not, of course, never have been and never will be. For me, that's water-color's and Life's great lesson: It does what it's going to do. So much seems to be happening right now. v The word "elucidation" keeps coming to mind and lips . It's interesting to think about the choices I have made or have not made. One made, decades ago, has been to enter more deeply into the artist's world, the inner sanctum where the soul rests, to commune and collaborate with it, and to attempt to paint from that place. In AM today began working on rattan chair. It's now 3:45PM. Will take dog walk and then back for a couple hrs more of ptg. This ptg's already taken 5 wks... will be atleast another two--Yikes! The time's passing so quickly. Happy the days start getting longer in 10 days. Now to bed. Been waking recently at 5AM. In bed doing heart chakra meditation and Reiki symbols, then rising at 6-ish, going downstairs to do email correspondance, then dog walk in wood, then making fresh carrot/ginger juice, then to studio to pt by 9 AM. Lately, feeling so much energy. Ptg, almost finished, hung it on lvg rm wall. First time the two 1/2's are joined. Lannis and I sat in silent awe. I need to do wall on left side, then some 'fine-tuning' over whole surface. Then the border. It's a crisp and clear Friday---The full moon two days ago. Augmenting my studio listening of Aldomovar's soundtrack of "Talk to Her" with some Glen Gould Bach, and from time to time a bit of Brian Eeno's Airport Music. Had wonderful couple hrs this afternoon working the full width and expanse of the w/c on the table, concentrating on the walls and doors with their blueish, greyish,rose-dore-ish sienna-ish tones. Listening with ear phones to multiple Baroque selections. Definitely 'Fugue-Time. Seventh Heaven for me. As usual, going to let the ptg take whatever time it wants and needs to complete itself. In fact, I have no choice. The energy since before dawn has been intense and bright--- again, a certain elucidation taking place, and this, the Eve of the Winter Solstice. 21 December 02, The Solstice Major day. Lannis had a revelatory night. This AM as she shared it with me, I was filled with its gift and its light. As a result, I got so much ptg done in the studio. It's about two or three days from completion. It'll have been 7 1/2 wks in the making. Lannis said: "It's an ah-hah! day." Also, last night Lannis said looking at BIOGRAPHY, as it hung almost completed on the living room wall, "It's like a play". I know what she means. There are the characters, there's the plot, there's the decor and the scenery, and there's the unfolding of an action. Moreover, the two halved arched windows on either side of the wall, create the feeling of curtains on the sides of a stage. Today, realizing once again painting for me is a vocation. Today, I will be tearing down the borders around the ptg, looking at the ptg, putting in the necessary finishing touches. It's a bit of a letdown, this finalizng stage. After almost two months living and being together every day. It'll be gone before we know it. Now, to tear it down, paint on it, and see it anew. Feels appropriate to be completing this Biography ptg during the Solstice time. As Allen Marshall pointed out to me in an email today, these lengthening days of early winter are the preparatory time for Spring's growth. I just put the torn-down Biography on the studio wall, and guess what? I think it's finished! Now, I want to put some order in studio, particularly the surfaces including the ptg table. It's gotten quite cluttered. For me it seems creativity soars within chaos. While I'm ptg I find an order in chaos. Realized today that the Alexander Liberman photo of Picasso in his Studio, (actually it was'nt far from here, his studio), this photo which we have up on our w/c wall and which I've carried with me for some 30 years, is also a vision of an artist's studio wall. Also, looking back, there were my childhood's bedroom wall which I covered with photos of movie stars. There were also the 12th Street studio wall with all the images on it. Also the San Francisco Bulletin Board I showed at Mills College. Also the collage on canvas that was in the Whitney (a telegram I sent to Johnson during Vietnam war, a Vietnamese Man crying, etc.). Later, still on 12th St. there were the photos of Tut and Cheetah from Paris Match which inspired the first "whole image" ptgs I was to do. Then, eighteen months ago, the Scenes from a Life: Studio Wall. And now these Biography images. So, multiple images have played a crucial part in how I have surrounded myself with photos and repros of works of art, etc. all my life. Spent afternoon going through slides and picking out a selection to view with Lannis for printing at the photo lab in Nice as possible ptgs for down the road. Then looked again through the Albert Kahn Gardens' photos fom Paris of last Oct. Finally, went through the already enlarged color prints of photos I've taken. Viewed the latter with Lannis in early evening and decided upon two to pt: The Tibetan Altar we have in the kitchen. Also the white bird seen in the twilight sanctuary in LA. I'll call the first "Altar", the 2nd "Sanctuary". Will paint "Sanctuary" first. It'll be a long relatively narrow vertical with a dark, perhaps black border. It's an ageless moment, with an ancient Chinese painting sensibility to it. I like it alot. Feels right for now after Biography's wide full horizontal expanse. Spent AM cleaning studio surfaces of tables and storage cabinets. Throwing lots away which had accumulated these past two Biography months. In afternoon drew in Sanctuary. It done, turning around I saw the 'finished' Biography. Turns out, it needed more work. The wall isn't dark enough. More contrast needed. That way, there'll be more dramatic pull. I'll work on it tmrw. Yesterday's drizzly grey has been replaced with a bright sunny morning. Yesterday, wrote to Al Ujcic that this is a time of new birth and extended light. And so it is. On many levels. Now to start darkening and solidifying the wall on Biography. L&I opened Christmas presents sent to us. One from the Makkinks, a book entitled "Old Man Goya". Isn't that perfect? Yet another synchronistic sign. Another biography come our way. By the way, when Lynne was here in one of our recorded conversations, Lannis spoke of Jung's Memories, Dreams and Reflections, an example of an older person transcribing his view of his life. A summing up. I've got the studio's sliding glass doors open and a wonderful fresh winter air fills the room. Ptg the ptg's wall on my studio wall vertically. Usually I work flat on a table. This act of ptg on a vertical is an exhuberant feeling. Spent the morning on ptg. Then saw in afternoon it needed more work. Lannis and I discussed it and we saw certain areas which needed a bit more attention, and little by little it all came into a heightened state. A wonderful sacred moment of collaboration. Ahhh, "Biography" is now completed. Tmrw we go to Nice. Then, the next day, Friday beginning Sanctuary.